Xinjiang is famous for its melons in the summer months. Many truckloads lined my route. At the Chinese border town of Takeshiken, I had the sweetest melon I ever tasted. The Xinjiang Uyghur Autonomous province of China is famous for its fruits in summer. 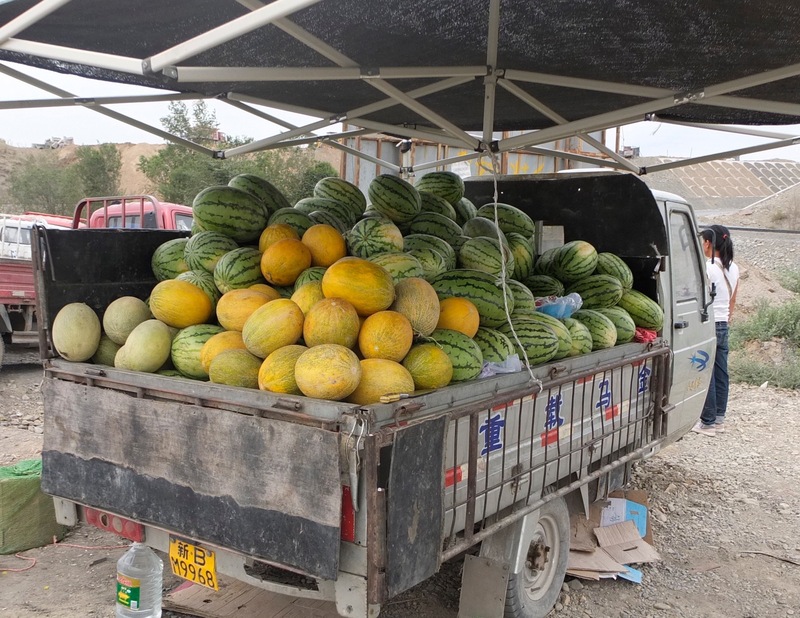 Being deprived of fresh fruit in Mongolia, the site of a truckload of watermelons sent me into a frenzy. I tried a watermelon and a large yellow melon, similar to a cantaloupe. One bite sent sugary sweet juices gushing down my chin – I was in heaven. I also had several bowls of laghman at a friendly restaurant. Laghman are hand pulled noodles, served in several varieties. Typical laghman is usually cooked in a spicy tomato sauce with vegetable and mutton. It was absolutely delicious and flavour rich compared to the simplicity of Mongolian food. 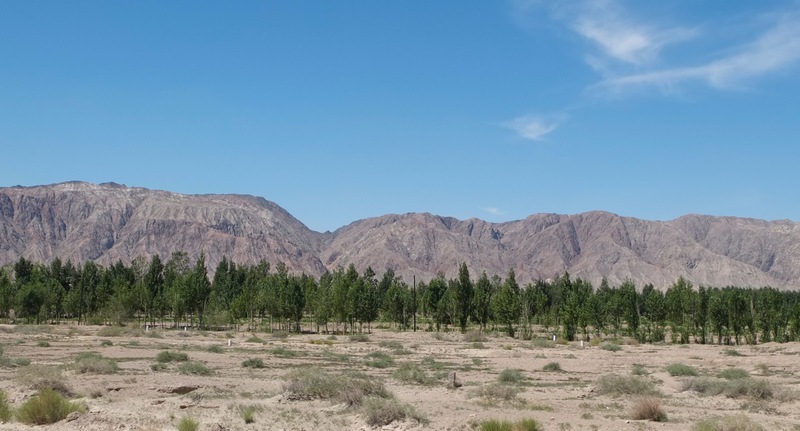 After a day of rest in Takeshiken, I turned West and then South into the desert towards Urumqi. 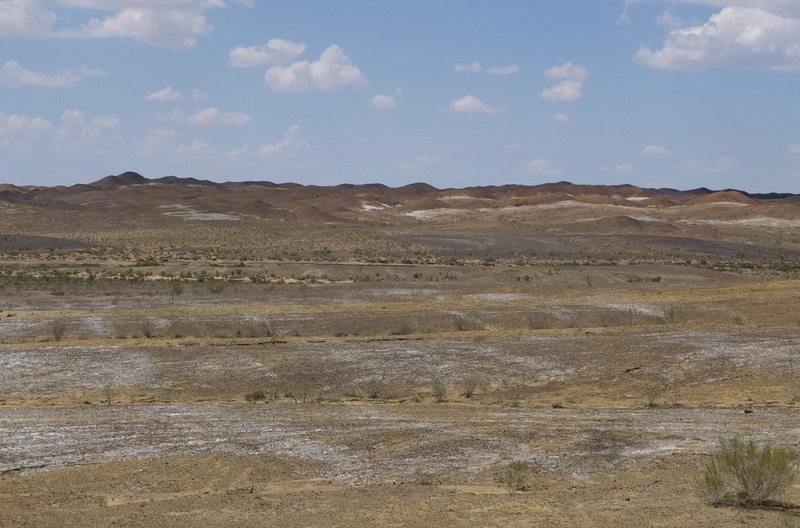 Emerging from the vast emptiness Mongolia, I knew that developed China would come as a bit of a shock. Rows upon rows of power lines stretched across the landscape and real traffic appeared. The ride from the border to Urumqi was quite dull and fairly busy. 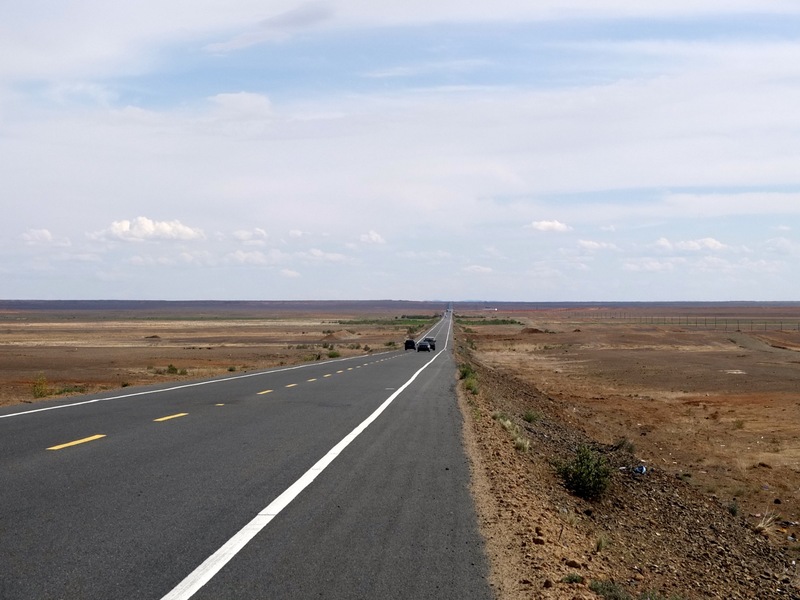 I had decided to take the main road so that I could get to Urumqi as quickly as possible. 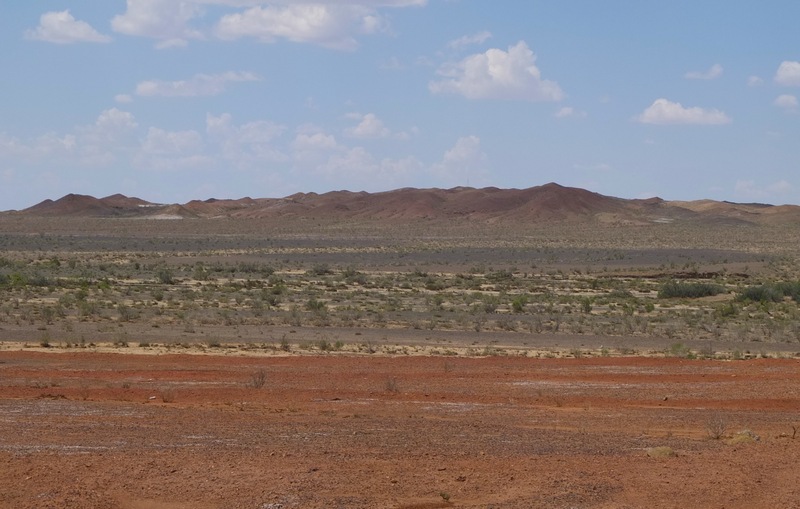 But in between the long stretches of dull desert scenery were short bursts of brilliant colour to break the monotony. 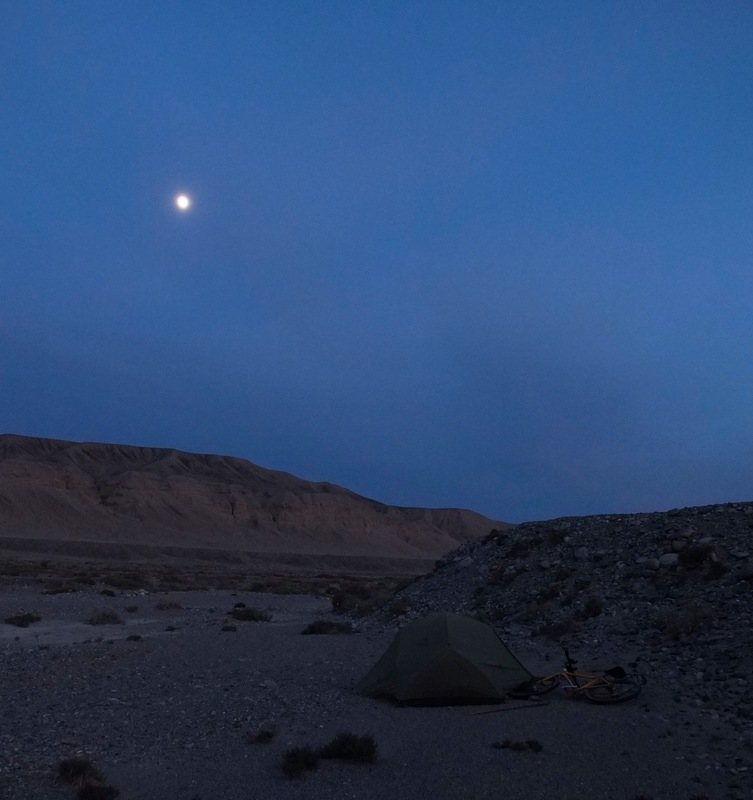 In Mongolia, I spent the majority of my time wild camping. In China, foreigners aren’t technically allowed to camp, as they are supposed to be registered in a hotel every night. Since there is no real way of keeping track of your whereabouts, camping is possible if you keep out of sight. Thus, I learned to master the art of stealth camping. Tunnels under the main road became my site of choice. Sometimes there would also be a break in the barbed wire fence lining the road and I could sneak behind a sand dune. I emerged from my sandy campsite early one morning to find a large convoy of trucks parked. This line of trucks turned out to be 10km long and were stopped due to an accident (a truck’s load had tipped). In this situation, it was clear that I had the vehicle of choice. I enjoyed a rare traffic-free 30km of riding. Then, disaster struck. Suddenly, my brakes started to jump sideways as I was pedalling. After making several adjustments, it took about 20 minutes for me to realize that my rear rim was severely cracked. 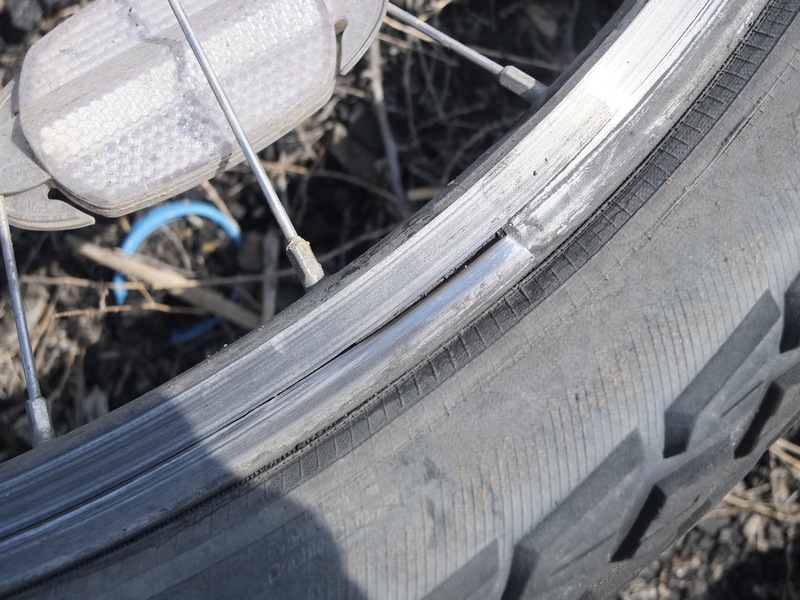 Luckily I was only 130km from a large city, Urumqi, where I could get a new rim I consider myself lucky that this didn’t happen in Mongolia as I would probably have had to take transport across the entire country. Soon a police car drove by and I waved them down. The kind officers took me back to their station, fed me nan (bread) sweets and drinks. After, they found a passenger van that would take me and my bike to Urumqi at no charge. This was only the beginning of the incredible hospitality and kindness that I would experience throughout Xinjiang. 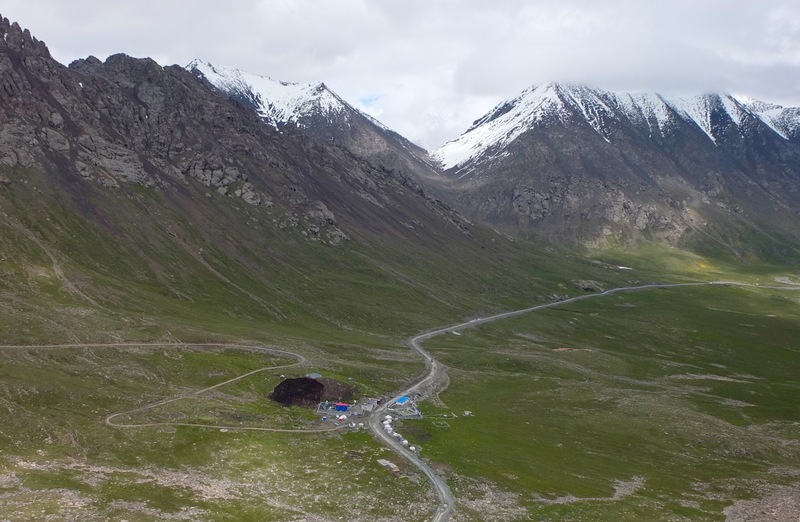 The Xinjiang province of China is home to the Uyghur minority, whose language and cultural traditions draw similarities to those in Central Asia. Many Uyghurs are Muslim. Once, the Uyghur population made up the majority of the province, but with Han Chinese immigration it is now less than 50%. 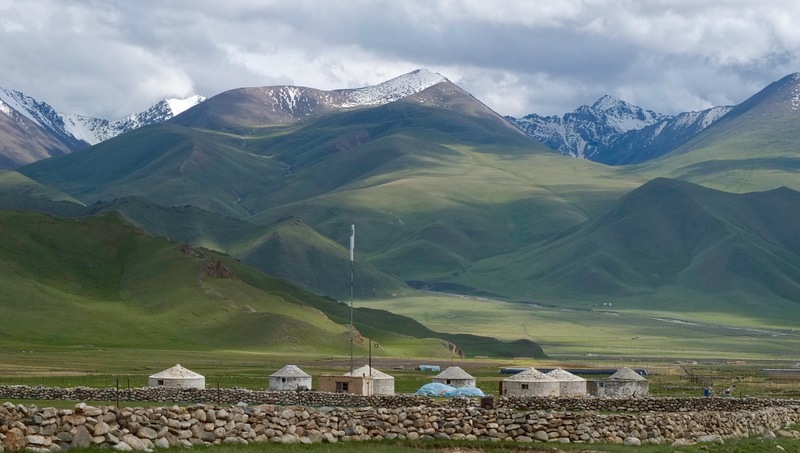 As the Uyghurs fight to preserve their culture, there is constant tension in the region. 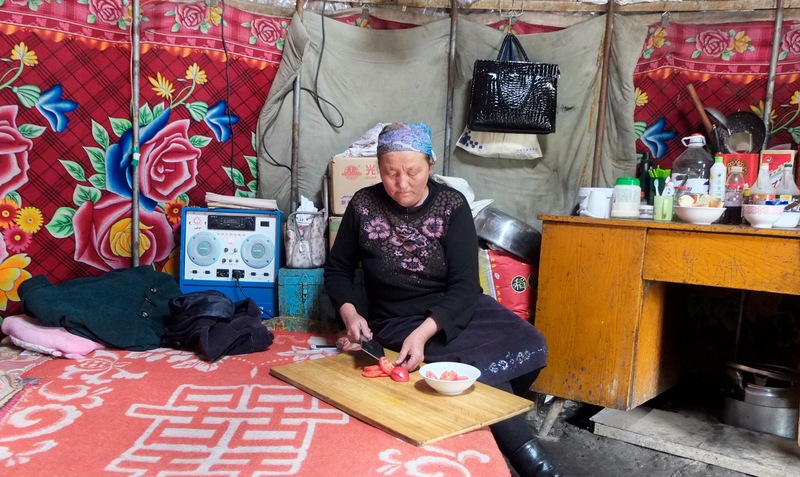 In the large, chaotic, city of Urumqi the traditional Uyghur way of life could only be experienced in small pockets. Tucked in between the flashy shopping malls and intense traffic were small stalls cooking up laghman and grilling kebabs (skewers of meat or vegetables). You could have just about anything cooked on a stick from potatoes to tofu to goat intestines. 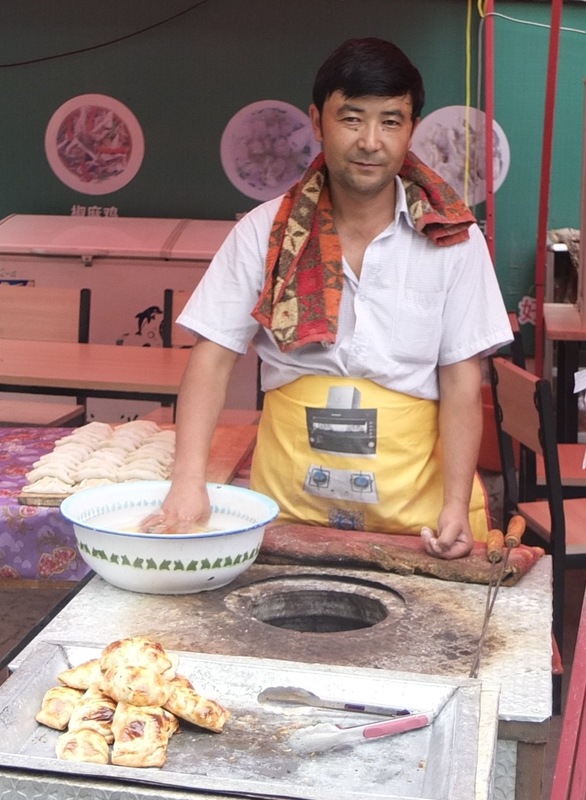 Delicious food was to be had everywhere and I spent a lot of my time gorging on Uyghur street cuisine. Fruit was also abundant – cartloads of the juiciest peaches, apricots and melons. I was also able to get a new rear rim and had my wheel rebuilt within 30 minutes. At my hostel, Maitan, I met three other French cyclists. 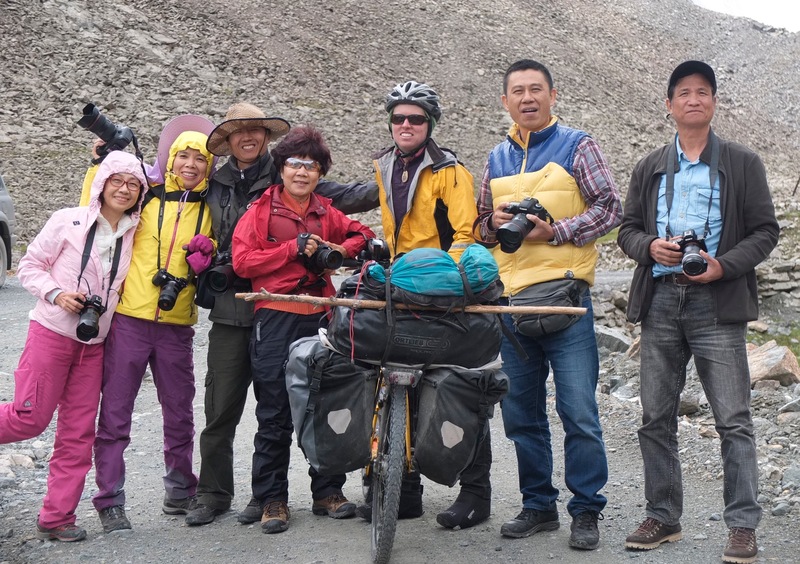 Lucy and Pierre were a couple that were cycling for a year from France to Ulaanbatar. 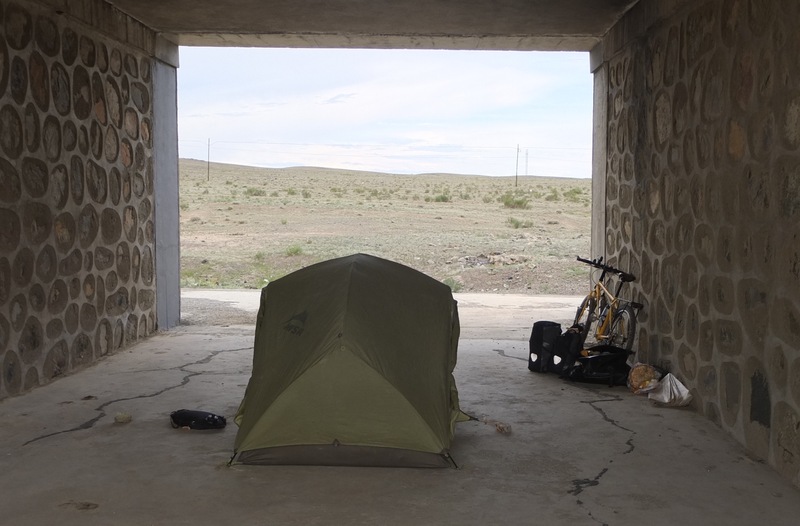 Christophe was solo cyclist who had already zig-zagged 28,000km from France to Urumqi. Together, the three of them were headed in the direction I had just come from. My first day in the city I met Jay from Colorado, USA who was headed West from Urumqi to Central Asia via train, bus and folding bike. I also met two very passionate birdwatchers from the UK, one of whom had identified over 8500 species in his lifetime! 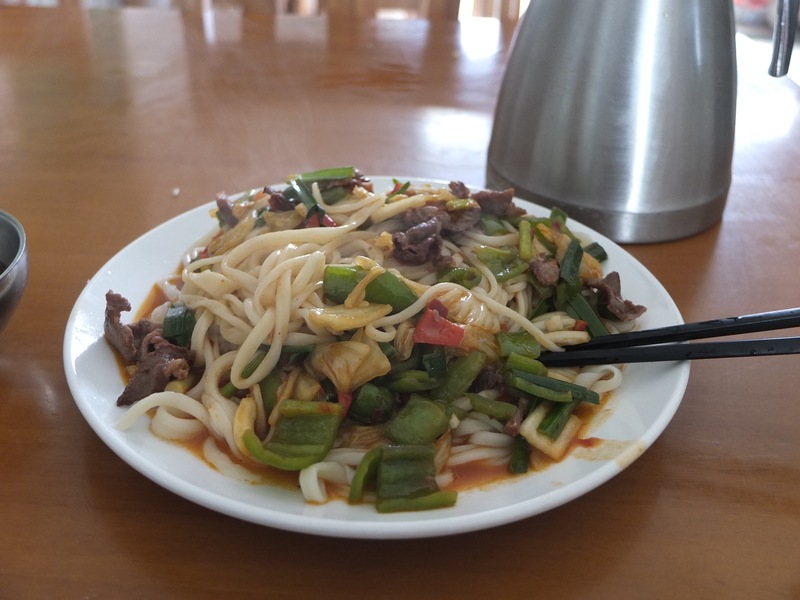 I enjoyed my days and nights in Urumqi, gorging on food and wandering around the city. I had a wonderful time with some great people and it was very difficult for me to part ways. I knew that I had a very challenging few days ahead of me. 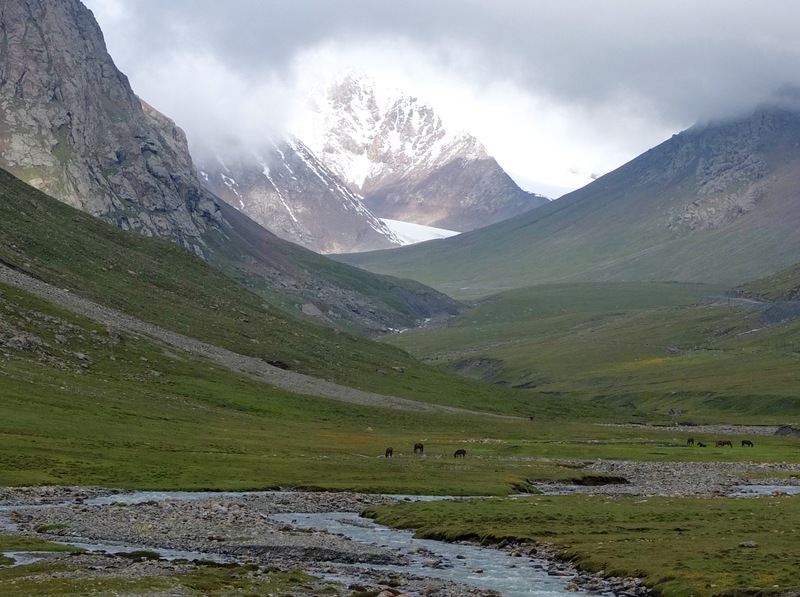 Over the next 130km I would be ascending 3000m to cross the Tian Shan range, the “Heavenly Mountains”. 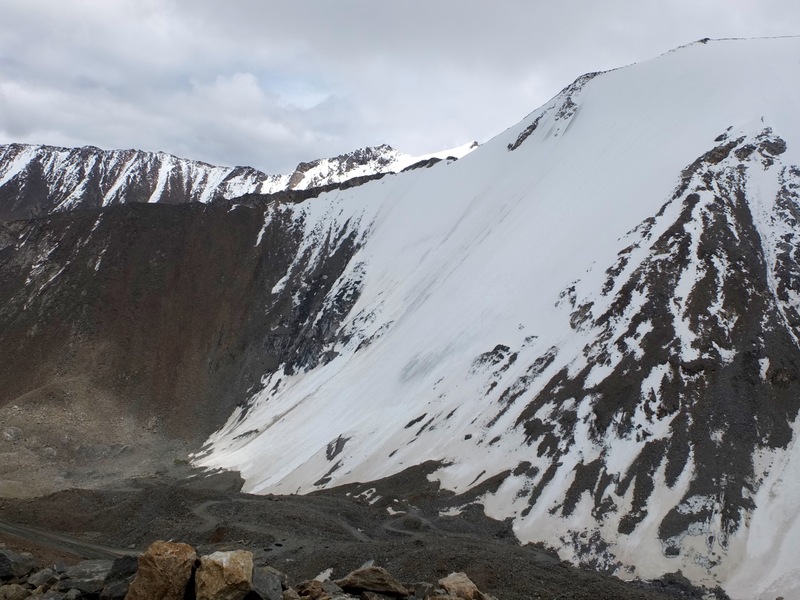 The first day I climbed steadily out of the chaos of Urumqi. On the way I stopped by a woman selling watermelons. It made the perfect snack to provide relief from the oppressive heat. As I climbed higher and higher, the traffic became lighter, the air cooled and large green hills emerged. I passed the ugly industrial town of Houxia and found a place to camp by the river. The next morning I continued to climb and the scenery grew increasingly spectacular. The road zigzagged higher and higher and I struggled to find the energy to carry on. The weather had turned foul and a cold rain beat down on me for several hours. The altitude was also starting to get to me and I only managed 30km that day. 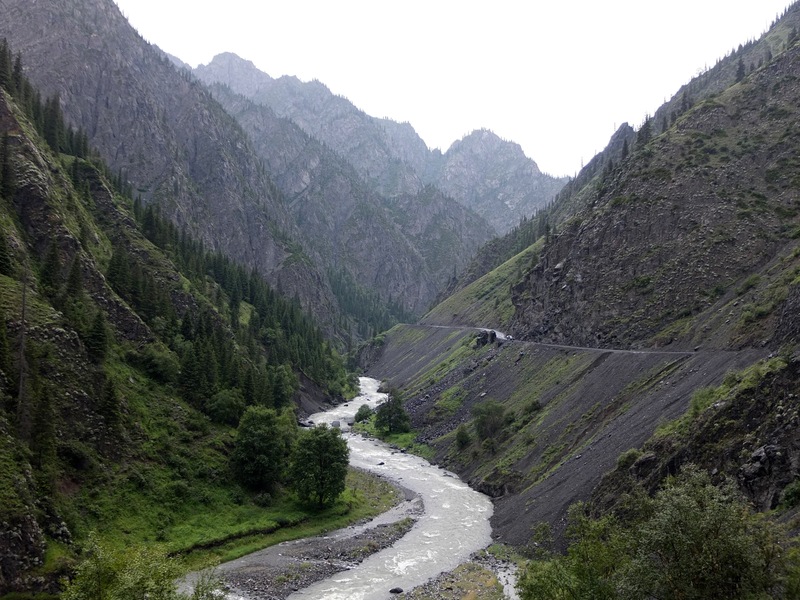 Finding place to camp was difficult as the road hugged the edges of cliffs that plunged steeply to the river below. 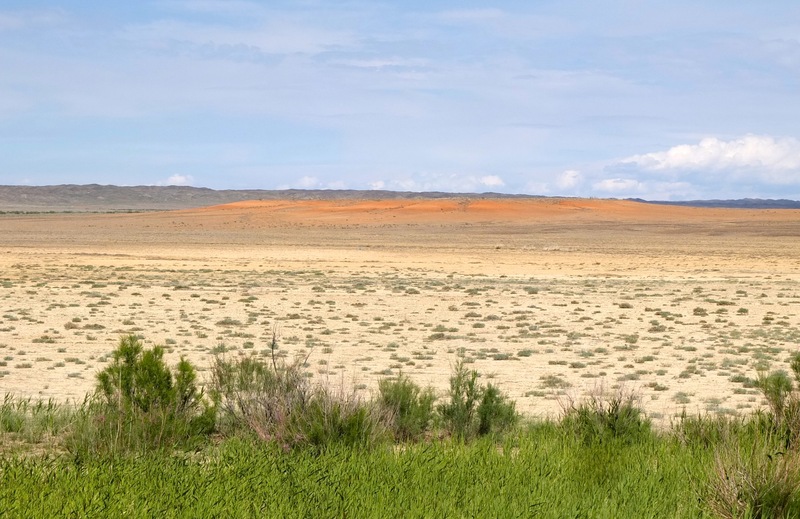 The second I spotted one small patch of flat land I decided to stop, not knowing when the next opportunity to camp would arise. I had another 15km to the Shengli Danba pass at 4280km, which I would tackle the next day. 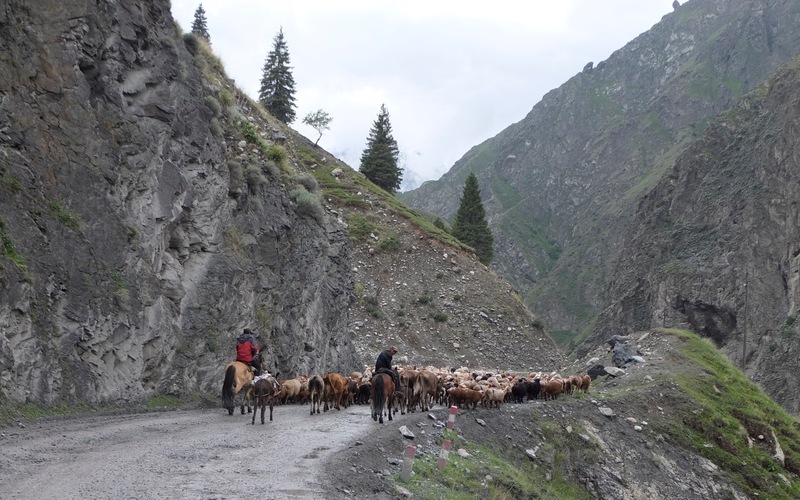 Just below the start of the steep switchbacks to the pass, I stopped for a simple lunch of bread, onions and tomatoes in a Kazakh yurt. After lunch, I pedalled to the start of the switchbacks. Then, a van stopped and a group of wonderfully energetic Chinese tourists jumped out. They took many photos of me, shouting out phrases like “Superman!” and “you’re my hero!” They gave also gave me some delicious snacks that really saved me afterwards. I felt like a celebrity and it gave me great motivation to start the climb. “You’re my hero!” 🙂 I loved these guys. 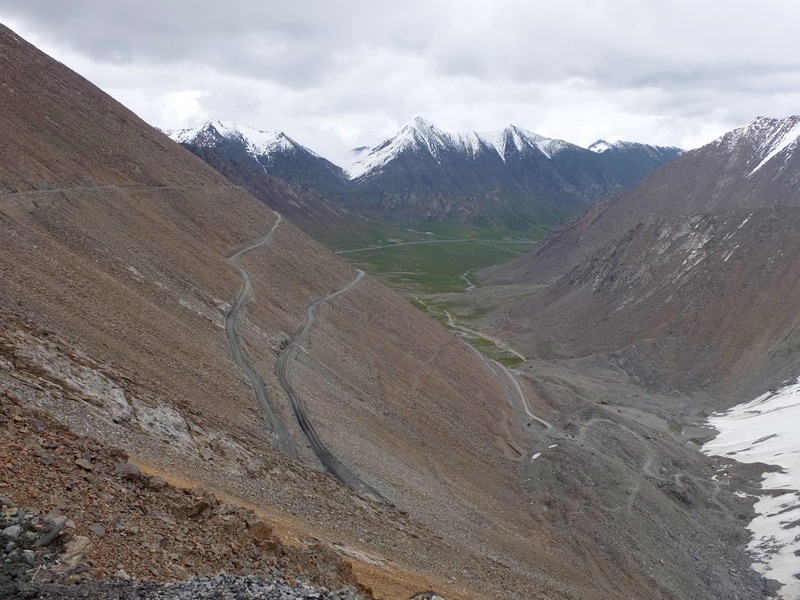 The switchbacks took me several hours to climb and I finally reached the top of the pass. The descent was slow and rough. 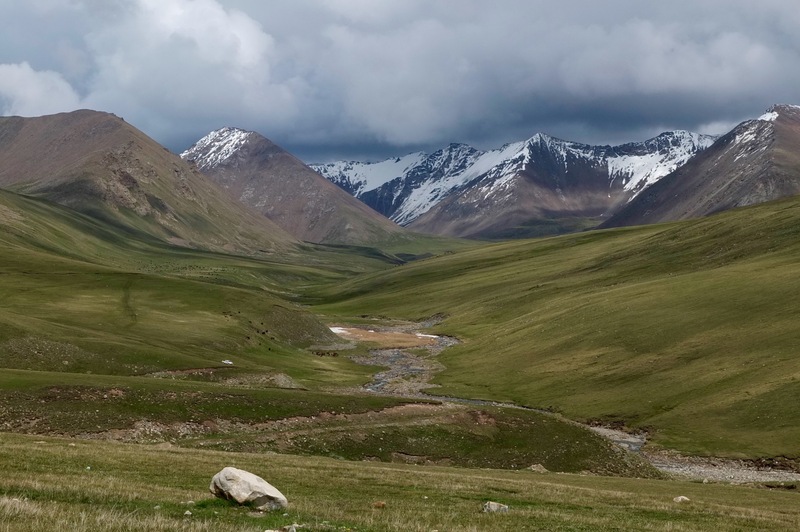 I passed lush green hills and meadows with wildflowers – a scene that was reminiscent of Mongolia. The condition of the road, however, went from bad to deplorable and would stay this way for the next 50km. This was surprising to me as the majority of my cycling in China has taken place on pristine paved roads. The truck traffic began to increase and I grew very tired of the endless potholes rattling my bike. Finding a place to camp once again proved to be very tricky. I eventually pulled off the road and camped behind a tree next to the river. It was a little too close to the road for my liking, but I was exhausted and didn’t have the energy to continue. I slept poorly that night, disturbed by the constant truck traffic. The next morning I thankfully had only 30km left of the terrible pot-holed road. When I reached the small town of Balguntay, I was stopped at a police checkpoint. 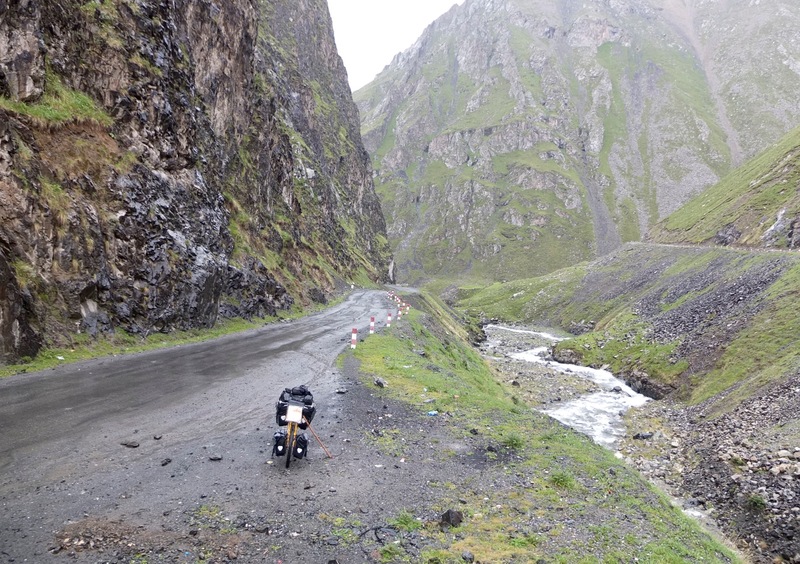 The police tried to tell me that the road to Korla was closed to foreigners. I knew that this was nonsense as I had heard of several cyclists that had passed that way quite recently. They kept pointing to a picture of a Chinese passport and I responded by saying, “no, I have a Canadian passport” – playing the clueless, naive foreigner. By the fourth “wo bu mingbai” (“I don’t understand”) they let me through. I finally hit a first class sealed road – the type that China is known for. I freewheeled at high speed for the next 40km and eventually shot out into open desert. Soon, more green started to appear and the road became lined with poplar trees. Several stops by roadside melon trucks brought me relief in the heat. Eventually I reached Korla – a green and chaotic oasis city. 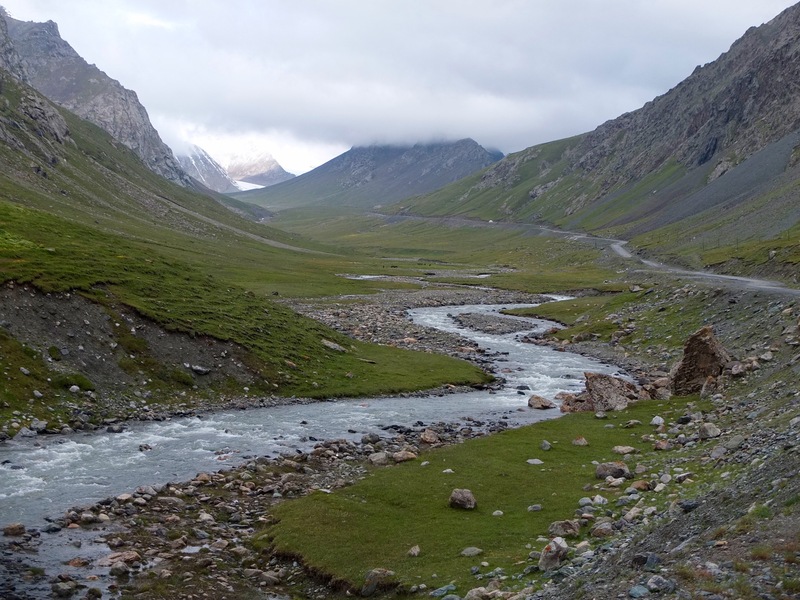 From here I would head west 1000km to Kashgar, one of the most famous Silk Route cities. Long stretches of empty desert beckoned. 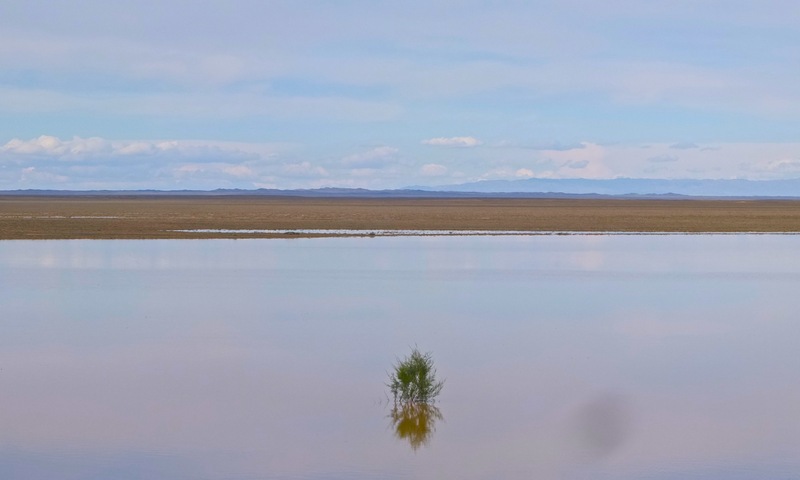 To the North lay the Tian Shan foothills and the vast expanse of the Taklamakan desert to the South. This entry was posted in China by taraleighweir. Bookmark the permalink. “Laghman” sounds like the Mandarin for pulled noodles, 拉面 or “LA1 mian4” which you’ll be able to find some version throughout most of China. If you get in a pinch and need translation help, just let me know.